One of the ads I’m designing for the March issue of The Carriage Journal is a full-page advertisement our 2014 International Carriage Symposium (next February at Colonial Williamsburg). The focus of this fourth biennial symposium is carriage and wagon accessories, which includes lamps, livery, whips, etc. In searching for an image to illustrate this particular ad, we went through Jill’s collection of Vanity Fair’s prints of famous coaching men. 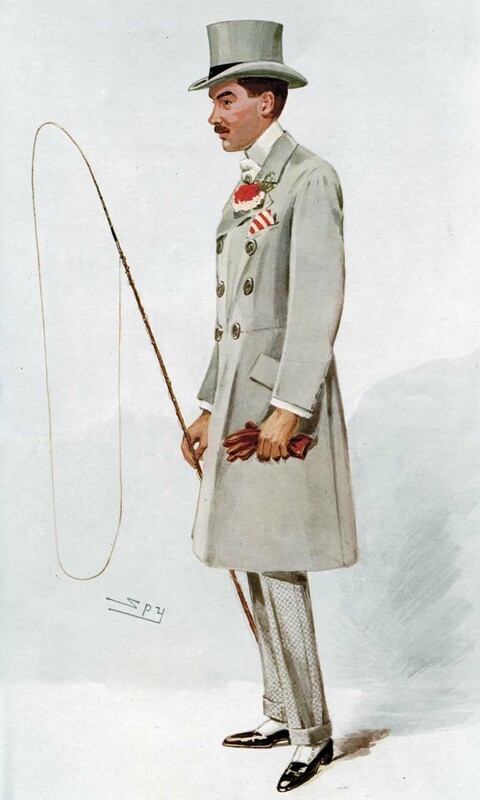 And we found this lovely print of Alfred G. Vanderbilt. You may remember him as the American coaching enthusiast who took his coach, the Venture, and eighty horses to England, in order to drive them on the London-to-Brighton road for several weeks during the summer of 1908. (You either already knew this or picked it up from yesterday’s tweets, right?). He was a little too tall for my scanner, but I managed to scan him in two parts and stitch him back together quite nicely. He is not only an Amazing historical driving figure but also my Hero!! We have his Brewster Pony Stanhope Gig he bought for the Hackney stallion Mel Valley Wonder in 1908….and it is an honor to turn it out!! The Vanity Fair Covers, would be a brilliant reproduction Print project!! !